Quietus est ... he is quit. There is no such thing as an ending, just a new beginning. Throughout the millennia, extinction has been the norm and survival, the exception. When faced with the hour of departure, will mankind fight to survive? NOT ONLY WAS THERE A PATIENT ZERO, THERE WAS ALSO A LAST PATIENT. A new dystopian, post-apocalyptic fiction series from author Bobby Akart (The Blackout Series, The Boston Brahmin series and the Prepping for Tomorrow series). The events depicted in The Pandemic Series are fictional. They are, however, based upon historical fact. QUIETUS concludes The Pandemic Series. For Mac and Hunter, and all mankind, there is no means of avoiding the final death blow brought about by the spread of the deadly plague virus. With every human contact, you run the risk of contracting the disease. Each surface you touch may have been contaminated by someone else. Every animal you encounter, or eat, could be contagious. Rules of survival have changed. Humans must adapt, or die. 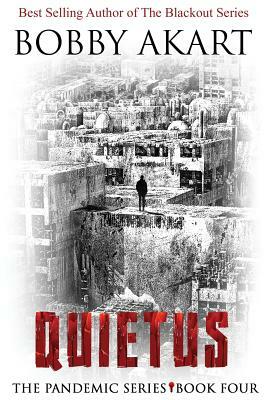 This is an ingenious, inventive post apocalyptic dystopian thriller series about the threats we face from a global pandemic, and the use of infectious diseases by terrorists as they wage jihad around the world. Drawing on his unique talent to place the reader in a post-apocalyptic world, Bobby Akart delivers an explosive page-turner that has you wondering - will there be a last patient? Note: The Pandemic Series does not contain strong language. It is intended to entertain and inform audiences of all ages, including teen and young adults. Although some scenes depict the realistic threat our nation faces from a worldwide pandemic, and the societal collapse which will result in the aftermath, it does not contain graphic scenes typical of other books in the post-apocalyptic genre. I believe more of our young people need to lead a preparedness lifestyle. Studies show that our millennials do not have any of the basic survival skills. By writing this series free of vulgarities and gratuitous sexual innuendo, I've intended it to be suitable for everyone. Thanks.